Image caption A survey found "most Cambridge citizens and visitors approach the prospect of a Cam swim with a healthy dose of scepticism"
Researchers are testing the water in Cambridge to identify the source of bacterial infections affecting rowers and swimmers. 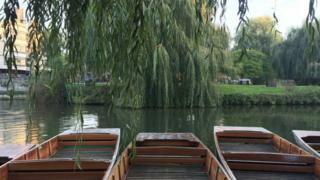 The River Cam is popular with tourists for punting, and is used regularly by university rowers. City pollution and local agriculture were blamed for reported infections among river users, scientists said. Now a study - called Puntseq - is using DNA analysis techniques to "target potential microbial culprits". Puntseq's survey of regular river users found that one in five "obtained an infection likely attributed to Cam water contact". Symptoms included so-called "swimmer's itch", fever after swallowing water, and wound infections. In 2014, organisers cancelled the first City of Cambridge Triathlon after the river tested positive for potentially-fatal Weil's disease. Geneticist Max Stammnitz, 29, said doctors and conservationists were unable to determine which infections were making river users ill.
"The Cam does not have an industrial use compared with some heavily polluted areas of the world," he said. "But we will get an indication, over a stretch of 10km, of how diverse a waterway can be." The team collected water samples at nine points along the river, between Grantchester Meadows and Baits Bite Lock, at three different times last year - in April, June and August. PhD student Lara Urban, of the European Bioinformatics Institute, said the team had "an important societal question to answer". She said: "People here are very divided: some will just go swimming everywhere; others say they wouldn't even put their hand in the river. "We have not found anything 'super dangerous', but we may have one candidate that is known to cause wound infections and come from agricultural input". "The river attracts so many people because it has so many facets - the tradition of punting, the beauty of the colleges - and the fact that 10 minutes along the towpath you're in pristine countryside," he said. "Anything that helps build up a bigger picture of the overall health of the river is a good thing."